Howdy, Hatcheroos. You’ve most likely heard the hullabaloo at this point about the “Power Laces” Nikes from Back to the Future Part II. They’re now a reality, and by reality I mean “close approximation.” You see, the shoes don’t actually self-lace, like the pair from the film seen in the clip below. I was naturally peeved about this – Nike was gonna make these shoes and charge a ton of money for them and they don’t even have the courtesy of actually making them properly? Then I learned that the proceeds from the shoes, which are being sold on eBay, are going towards finding a cure for Parkinson’s disease, via The Michael J. Fox Foundation. I can’t be mad at Marty McFly. And I guess I can’t blame Nike for not going all out, since actual self-lacing shoes won’t be a reality until we can master nano-technology or something – anything else would just be too bulky due to a necessary power source – see below. I’m still a little upset, but I guess it’s because of failed expectations. Here we are, four years from 2015 and hover boards, Mr. Fusion, pizza hydration, and all of the other awesome technology BTTF 2 promised us and we can’t even get the shoes right. All they really do is light up. 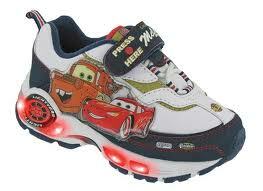 I had a pair of those when I was 10. What do you think, readers? I know Tiff would love a pair. Would you fork over money for these? 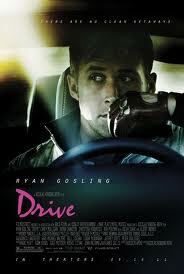 We’ll be at an advance screening of Drive tonight. I’ve got high hopes for this film – it’s holding at 92% on Rotten Tomatoes and the cast looks great. I’m excited to see Bryan Cranston in something other than Breaking Bad. I haven’t been thrilled with this season, especially last night’s episode. I haven’t seen Bronson or Valhalla Rising, two of Drive director Nicolas Winding Refn’s other films, so I don’t know what I’m getting myself into. Here’s hoping the film delivers. The blog is now officially a member of The Large Association of Movie Blogs. Excited to contribute. Hopefully it doesn’t turn out to be a cult or the front for a secret society or something. 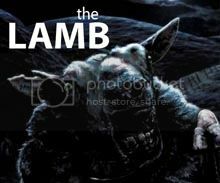 Welcome to the LAMB, and hope you enjoy DRIVE!! The movie was sold out when we got there! So much for winning tickets. We'll have to catch it later.